The new John Deere Hitch Assist system is designed to make the coupling of implements and trailers to the tractor hitch quicker, easier and safer. 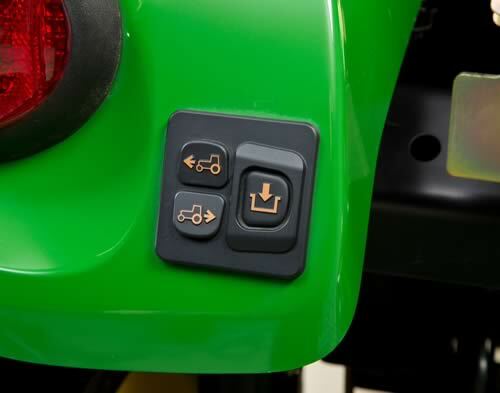 The driver only needs to leave the cab once to use a set of external fender-mounted switches to move the tractor backwards and forwards at a maximum speed of 12mm/second, or to lift the hitch. This reduces the set-up time needed, particularly for those who need to change implements regularly, as well as the heightened risk of accidents or injuries from repeatedly climbing on and off the tractor. A series of in-built safety checks and warning signals ensure that the process is completely safe to use, and the system is only operational if no-one is sitting on the tractor driver’s seat. The John Deere Hitch Assist system will be a standard feature on the new 4049R 49hp and 4065R 65hp compact utility tractors, which are aimed at small farms and smallholders, local authorities, greenkeepers, groundsmen and large property owners. The newly designed John Deere Smart Irrigation System allows more efficient use of water, nutrients, energy and labour by combining irrigation with the application of fertilisers to agricultural crops. 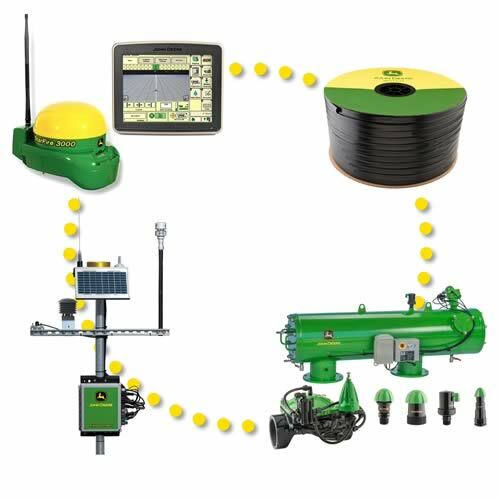 the innovative John Deere Field Connect Sensor system, which provides wireless data transmission of soil moisture and other environmental parameters, to allow control of water and nutrient applications via the internet.